Longtime friend of Lynchpin, Canadian artist Eveline Kolijn, presents new work. 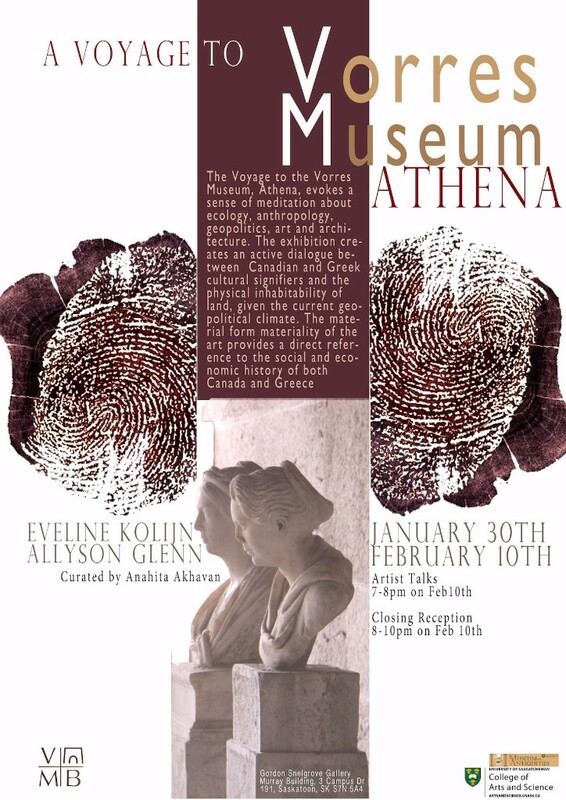 Artist Talks: February 10th 7 – 8pmAllyson Glenn and Eveline Kolijn are two practising Canadian artists who attended the Vorres Museum located in Paiania, Greece. Each year a Canadian artist is invited to participate in the residency program to gain an in-depth knowledge of the folklore and contemporary Greek art. During their residency, both artists engaged with the permanent collection of the museum, and immersed themselves in the creative art processes. With an established practice in Calgary, Eveline Kolijn’s work ranges from printmaking to installation. Influenced by abstract microscopic imagery of cells, natural patterns, and fossils, Kolijn’s work investigate the interrelation of the earth’s ecosystem and human culture. Concurrently, Allyson Glenn’s area of research surrounds the notions of cultural identity, history, social conflicts, and man’s relationship to the environment. The Voyage to the Vorres Museum, Athena, incites a sense of meditation about ecology, anthropology and geopolitics, art and architecture. The exhibition creates an active dialogue between Canadian and Greek cultural signifiers and physical inhabitability of land given the current geopolitical climate. The material form provides a direct reference to the social and economic history of both Canada and Greece. The two Canadian artists Eveline Kolijn and Allyson Glenn developed series of works that exhibit historical and contemporary art in Greece and their contradictory complexities inherent to each environment, society, and culture.